Are you hoping to wow your guests with blazing fast Internet and videos this coming Raya? BolehCompare is here to help with the latest information and comparison on the three main fibre broadband providers in Malaysia today! 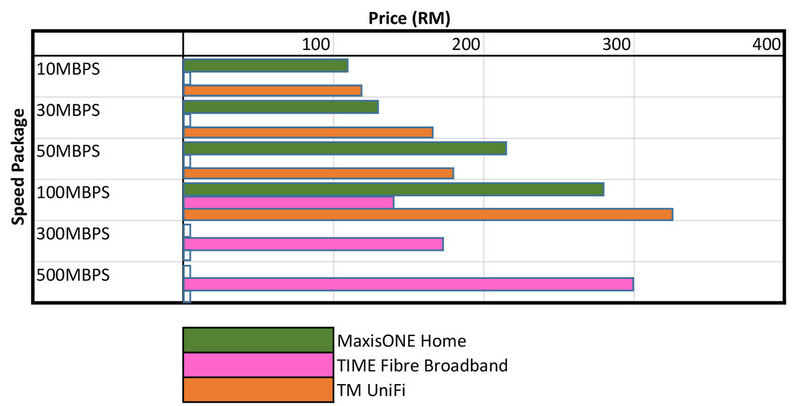 MaxisONE Home is Maxis’s fibre broadband offering. As usual, Maxis’s focus is on customer service and reliability, rather than affordability. You can expect to pay more, but you’ll also get better quality service in return. 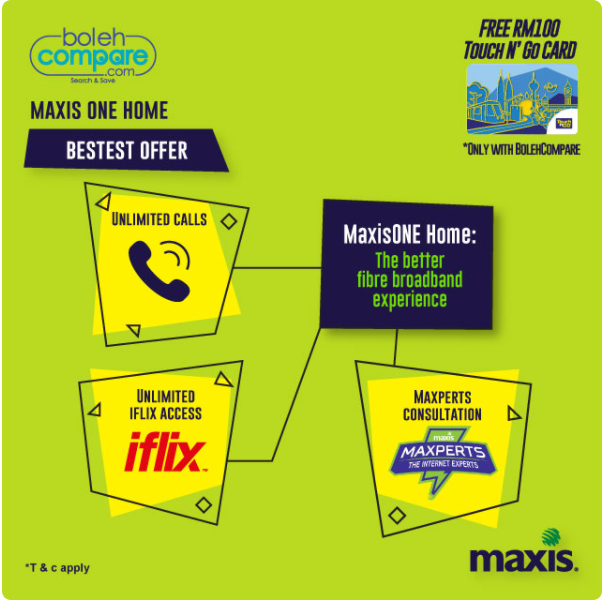 Currently, Maxis offers four packages under its MaxisONE Home banner, namely MaxisONE Home 10Mbps, MaxisONE Home30Mbps, MaxisONE Home 50Mbps, and MaxisONE Home 100Mbps. The fastest package, the 100Mbps, is available only through Maxis’s own coverage, while the other three share ports with TM. 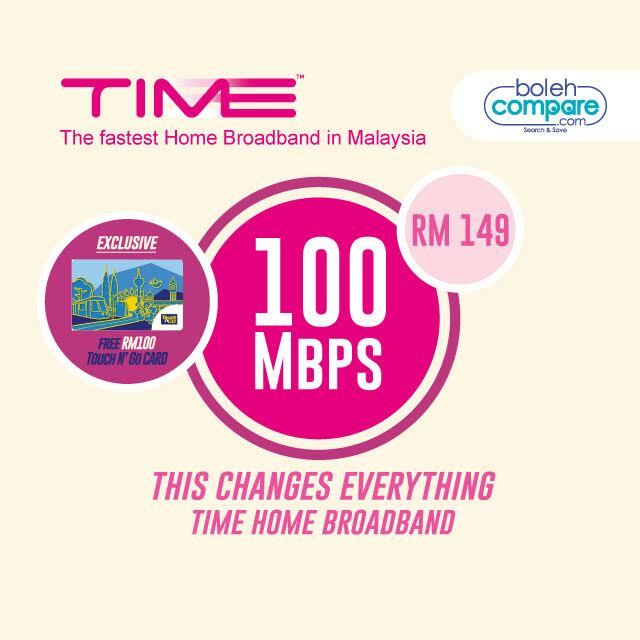 TIME is another established fibre broadband provider in Malaysia. If you’ve never heard of them before, but only heard of them recently, that’s because TIME only amped up their advertising and coverage in recent years. Currently, they have three fibre broadband packages, namely their 100Mbps, 300Mbps, and 500Mbps plans. TIME accelerates where other providers end – their fastest plan is a whopping 500Mbps plan, which is far ahead of other competitors. However, TIME is a pretty much no-frills offering, so you get blazing Internet speeds and little else. They are also focused on urban areas and highrises, so if you live in a landed property, your chances of subscribing with TIME is lower. 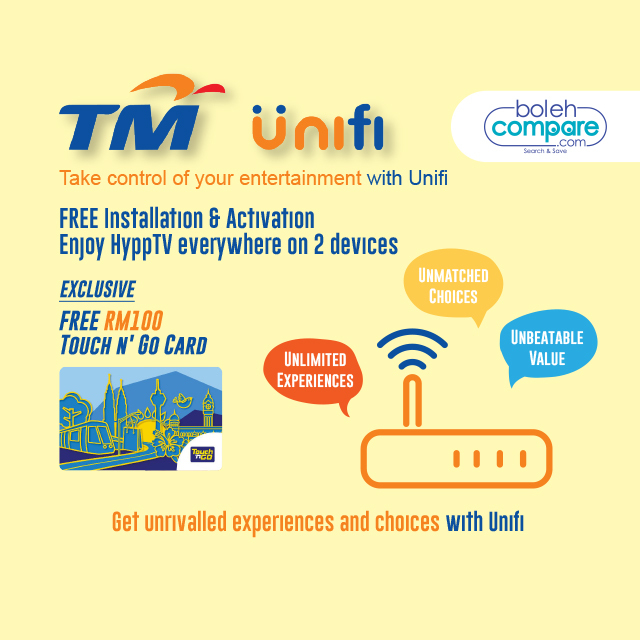 UniFi is Telekom Malaysia’s fibre broadband offering with four different speed packages. In terms of download speed, the packages are similar to Maxis’s – 10Mbps, 30Mbps, 50Mbps and 100Mbps – but the difference lies in their upload speed. Where Maxis’s packages offer symmetrical upload and download speeds, TM UniFi has asymmetrical speeds, meaning that their upload speed is lower than their download speed. The coverage by these fibre broadbands can’t really be compared directly, only generally. This is because you usually only have either one or the other at any one location. In general, though, TIME is mostly found in urban areas such as Penang, KL, and Johor, and they focus on highrises. Maxis and TM have no such constraints, so they’re more widely available. Maxis is the clear winner when it comes to freebies for its fibre broadband packages. Who doesn’t love free stuff, right? Maxis offers a whole range of freebies from unlimited iflix (movie binging time! ), Maxpert consultation, and a WiFi router. TM offers a WiFi router, HyppTV Box, and HyppTV Everywhere, while TIME continues its no-frills philosophy by having no freebies at all. So now that you’re more familiar with the major fibre broadband providers in the market today, are you ready to make a choice and jump into the fast world of fibre broadband!